When Facebook introduced the new timeline layout with cover photos, many people were annoyed with more changes to the free service they love to hate using. Others, however, say the cover photos as a chance to get creative and witty. The funny Facebook covers on this list were created with Facebook users with big ideas and perhaps a little time on their hands. The second list features 9 of my favorite funny Facebook covers that are ready to be used on your own personal account. As number 10, I’ve included the dimensions you need to know if you want to create your own funny or interesting Facebook cover in case this article has inspired you to get creative. Enjoy! This one just makes me smile every time I see it. It has everything that a Facebook cover needs to be memorable. It calls on an old favorite – Where’s Waldo, of course – but puts a bit of a unique spin on it. I’ve looked at this several times to make sure there is not, in fact another Waldo hidden in there somewhere. What a great way to make sure your friends spend even more time on Facebook. Out of all the funny Facebook covers I browsed for this article, this one stood out for me. I love the way the profile picture and the cover picture work together and the Steve Jobs quote suits it perfectly. And isn’t that just list life – the thing we want is always just a little bit out of reach. I love everything about this Facebook cover. It’s very well made with the profile picture fitting seamlessly into the Facebook cover itself. Instead of just having the profile picture interact with the cover photo in some way, this one really pulls the profile picture into the overall design. This is definitely one of the best funny Facebook covers I’ve ever seen.The look on the man’s face matches perfectly with the intense expression on the cat’s face which just makes the whole thing brilliant to me. Of course, it also happens to combine two of my favorite things – a creative idea and a cat. Definitely a winner in my books. Duck Hunt was my favorite game as a child so it’s always nice to see someone giving it a little love. There are lots of Facebook covers out there similar to this one (you’ll find another example in the ‘honorable mentions’ below) but I had to put this one on the list simply because it’s so well done. The only thing I would’ve personally changed was the gun. I wouldn’t used a profile picture with one of the original Duck Hunt guns but I can see why Tanner went for something a little different. I love this one. It’s fun and unique but it’s also incredibly creative. We’ve all seen photos like this one before but I have to give Richard serious credit for taking the concept and using it to create an awesome Facebook cover. I think I would’ve liked it a bit more if the man in the center of the cover was actually Richard or matched his profile picture but it’s a great concept executed beautifully all the same. This is just a fantastic concept from top to bottom. I love the question, I love the concept and I love how everything lined up just right. I also have to give Antonio credit for what I believe is a Guinness t-shirt. It’s the little details that get me, I suppose. I think what I like most about this one is that it will really work regardless of the profile picture he chooses, as long as the profile picture is a portrait. This is one of those Facebook covers that only really works with one, very specific profile picture but I don’t think it really matters in the grand scheme of things. 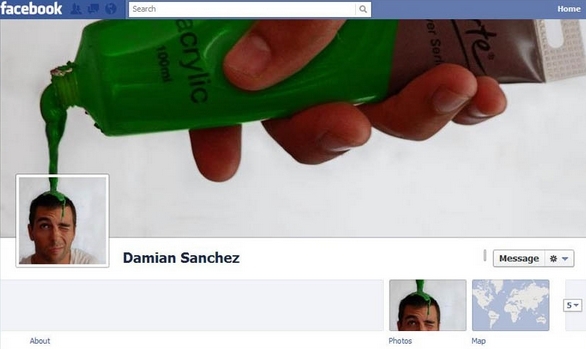 Damian created one creative, funny Facebook cover so I’m sure he could create another one if he decided he wanted to change his profile picture. The expression on his face is really what sells this one. Very well done. It’s a shame I can’t credit this one properly because it is, without question, the funniest Facebook cover I’ve seen thus far. It’s probably my favorite on this list. The cover photo and the profile picture just matches so perfectly and, come on, it’s a cat taking a giant bite of a hamburger. I’m sure there are those that will find this one a bit offensive but it really just is a harmless bit of fun that shouldn’t be taken too seriously. I adore this cover. Out of all the funny Facebook covers I looked at for inclusion on this list, I knew with certainty this one had to land at number one. It’s just absolutely perfect in every way. It’s just so incredibly well done. Giuseppe did a fantastic job on this one, for sure. The profile picture fits into the cover photo so well. I don’t think there’s anything about this one I would change. Brilliant job. These funny Facebook covers didn’t quite make my top ten but they definitely deserved a mention in this article anyway. They’re all terrific in their own way and are definitely worth seeing. Make sure you scroll down to the bottom for a few cover photos you can use on your own Facebook page as well as a template to create your own Facebook cover photo. 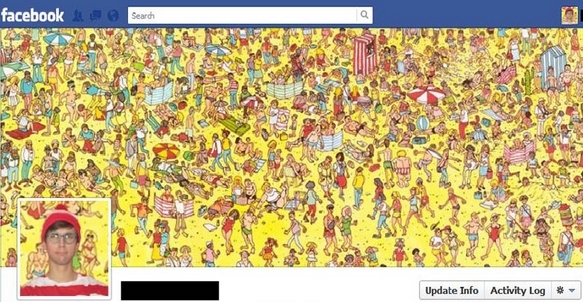 I love this funny Facebook cover because it doesn’t stick to the typical ‘Your Profile Picture Goes Here’ format. On top of that, it’s also fun and creative.I originally had this on the top ten list but I had to make cuts to get it down to ten. Were this a top 15 list of a top 20 list it would’ve made the cut for sure. This cover photo is similar to the Duck Hunt cover photo in that it also features a loving not to a classic game. I preferred the Duck Hunt cover solely because the profile picture and the cover photo played together so well but this one definitely shouldn’t be scoffed at. It’s very well done and certainly would be a good idea for someone who was into Doom. Here’s why I chose the Green Paint cover for the list over the water photo – the green paint made the whole thing a little bit more visually appealing to me personally. I like what Scott has done here though. The play of the water definitely works. The green paint just worked a little bit better for me. There are a few different funny Facebook covers that play on the Creation of David (such as #2 in the list above) but this is definitely one of my favorites, thanks, in large part, to the profile picture that accompanies it. The black bar really sells the photo. I didn’t choose to include it on the list simply because of the cat variation in the one I actually chose. This one is still fantastic though and has earned its honorable mention. The covers I’m about to share haven’t been personalized so you can easily post them on your own Facebook account. I’ve used some of them while others are just waiting for the perfect profile picture to go with them. Just click on the photo to get the full view and save it to a location you’ll remember. Once it’s saved, upload it to Facebook and enjoy! Want to add a little style and pizzazz to your profile picture? 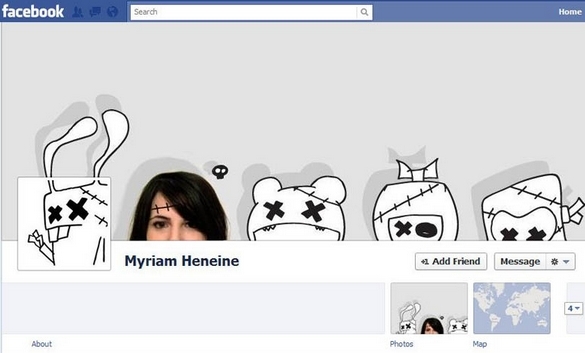 Why not use this funny Facebook cover to give your profile picture a top hat? I’ve used this one a few times and it always makes me smile. It also works great if you have a pet as your profile picture. You do need to use this with a portrait though. Anything else will just look a little weird. When I’m choosing a new Facebook cover photo, I tend to go for photos like these ones. They work with any profile picture you might choose to use but still offer a personalized feel to your Facebook theme. This cover photo is great because it’s fun, unique and entertaining. Those poor little guys on the end don’t even see what’s coming! This is currently my Facebook cover photo and it’s one of my favorites to date. I can’t tell you how many people have commented on it, just not getting the gag. I think that’s why I enjoy it as much as I do. I originally chose it because I have wireless internet so ‘loading’ is always an issue for me if I’m watching video or playing a game. This cover spoke to my frustration so I went for it. Then the comments started and I just couldn’t bring myself to change it. I have not yet used this one because I don’t like creepers. I find them … well, creepy. All the same, this cover photo really made me laugh so I decided to include it. It’s a nice ‘screw you’ to anyone you know likes to creep your profile but it’s also just a witty comment on the nature of Facebook to begin with. I honestly don’t have much to say about this one. It’s a bunny. It’s a bunny with glasses. How could I not include it on the list? It’s too freaking adorable for words. This is a great cover photo but it only really works if you have a certain kind of profile picture. It doesn’t necessarily have to be a portrait but it does need to feature something the giant hand would be picking up. There are a lot of possibilities here. Be creative. I’ve used this one a few times as well because it just makes me laugh every time I see it. The only thing that could possible make me love this one more would be in there was a little hat on at least one of the fingers or possibly even some yarn hair. That would just put it right over the top for me.I think that’s really all the explanation this one needs. 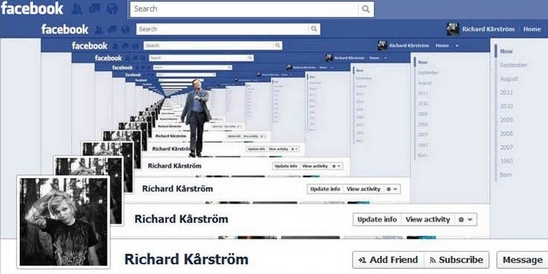 This is another funny Facebook cover photo that works regardless of your profile picture. I tend to opt for cover photos like this one because I change my profile picture on a fairly regular basis. I really just like this one because I think it’s hilarious. If you do too, give it a shot. I love this one. If you think of yourself as angelic or simply want people to think of you as angelic, why not add a halo over your profile picture to drive the point home? To make this one work, you need to have a portrait of yourself as your profile picture but that’s really the only requirement. Definitely worth checking out. A word of note about the dimensions here. This photo is not a traditional template but it should give you all the information you need to create a truly unique cover photo on your own. Follow the dimensions as they’re written on the photo and you should get it right. Remember, creating the perfect cover photo for your Facebook page is all about representing who you are and what you like. It’s also about being creative. Have fun with it!